It amazes me that even today, some business owners refuse to accept credit and debit cards as forms of payment. They are missing out on profits. I work near a cute little market that allows various vendors and takeout restaurants set up shop. Every business that is in this market processes cards except for one restaurant. Whenever I go there, every other restaurant is busy but his and it's not because the food isn't good. I can't tell you how many times I have left an establishment because they don't take plastic and I didn't have any cash on me. Quite frankly, it's an inconvenience for me to have to go out of my way to an ATM. And know this: I only go to my bank's ATMs because I refuse to pay for additional fees. If your business is going to refer me to the generic ATM inside the store to get cash because you don't want to set up a credit card processing merchant account I am just going to leave altogether; I probably won't be back. According to "The Survey of Consumer Payment Choice" conducted in 2010, roughly 80% of consumers have either a debit card, credit card, or both. And if you think that these people also keep a healthy amount of cash in their wallets, your wrong. Americans, on average, have $12 with them at any given time. When someone decides that they want to buy something, the first thing they always consider is the cost; how much are they going to have to part with? When a customer is using only cash, they will take more time to contemplate the purchase. They might "go home and think about it" because the physical cash will be leaving their wallet. 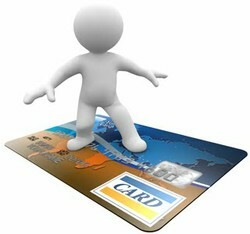 With credit cards, it's a bit like "out of sight, out of mind." There isn't the same psychological effect of parting with money. They don't have to pay until later so they won't worry about it until later. This is the same reason why people spend nearly twice on purchases made with plastic rather than cash. Why would a business not want to tap into this market? The reason that the restaurant near my office won't accept cards? He doesn't want to pay the merchant account fees on such "small ticket" items. Meanwhile, the tiny soup shop next to him that will take a credit or debit card sells $5 cups of soup. If that's not small ticket, I don't know what is. What I do know is that they sometimes have a line snaking around the entire building while no one is standing in line at the cash-only place. Like any service, payment processing companies charge fees to their merchants. A simple estimate of how much you will pay in fees is between 2% and 4% on each transaction; this could be more or less. Here's an idea! When you first open up your business, consider the price points and go up around 2-4% to offset the merchant fees. Do you think people don't do this? Think again. Here's the harsh truth: if you business doesn't accept cards, customers think that you're outdated. If your competitors are accepting cards, you are pretty much screwed. Consumers want options and if your only option is a cash payment, you're not very likely to get the sale.